Everybody knows that people in the Perfumeland* are wonderfully generous and kind – towards friends and oftentimes to other members of their group who they don’t know too well. 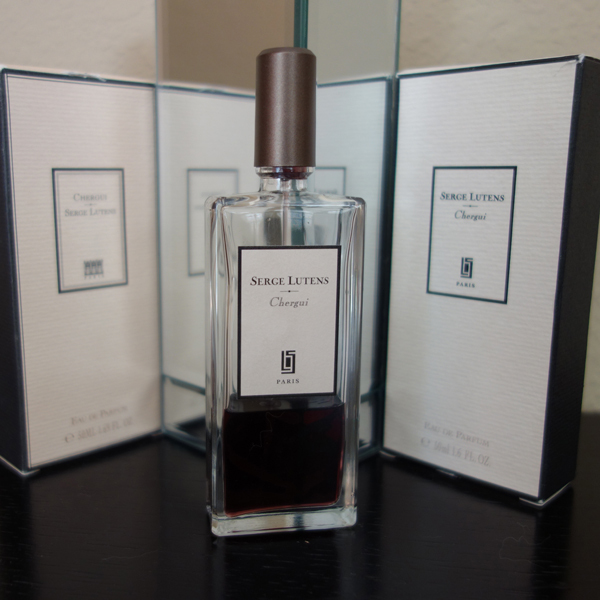 I got my first sample of Serge Lutens Chergui from Suzanne of Suzanne’s Perfume Journal(read her perfect explanation why to wear Chergui in summer). I liked this perfume though until recently for me it was a cold weather perfume. I finished Suzanne’s sample, then one more sample and was thinking of getting a decant, when Vanessa (Bonkers about Perfume) sent me her partial bottle of Chergui as an unofficial present for my birthday. I was happy to get it in a bottle: even though those take more space than decants, in the last years I noticed that I tend to favor actual bottles. I got home, confirmed that I wasn’t confused and even sent Vanessa a proof of having that box. Vanessa had no recollection of how she came to own that second box; and since she had no use for it she used it to send samples to me, making the answer to the post office clerk’s question “Are the bottles in their original boxes?” at least partially truthful: the box was original indeed. Chergui is one of rare perfumes honey in which does not go urinous on my skin. As I started thinking about this post, I wore Chergui a couple of times, and I have to agree with Suzanne: it wears nicely in the hot weather. Too bad I cannot use a back-up box to even better protect perfume from that heat. I’ll have to rely upon a more conventional method – an A/C. I couldn’t even interest Rusty in checking it out: he clearly didn’t think it was that interesting the first time around when I tried to make a “proof of life” picture shown above. Speaking about back-ups… Are you getting any for your Serge Lutens favorites pre-repackaging/reformulation/moving to the Exclusives Collection? * Of course, Perfumeland isn’t unique in that respect: people inside other groups with similar interests behave that way. But I’m writing about my current interests, so forgive me this … hmm… what would be the right antonym for “generalization” in this context? 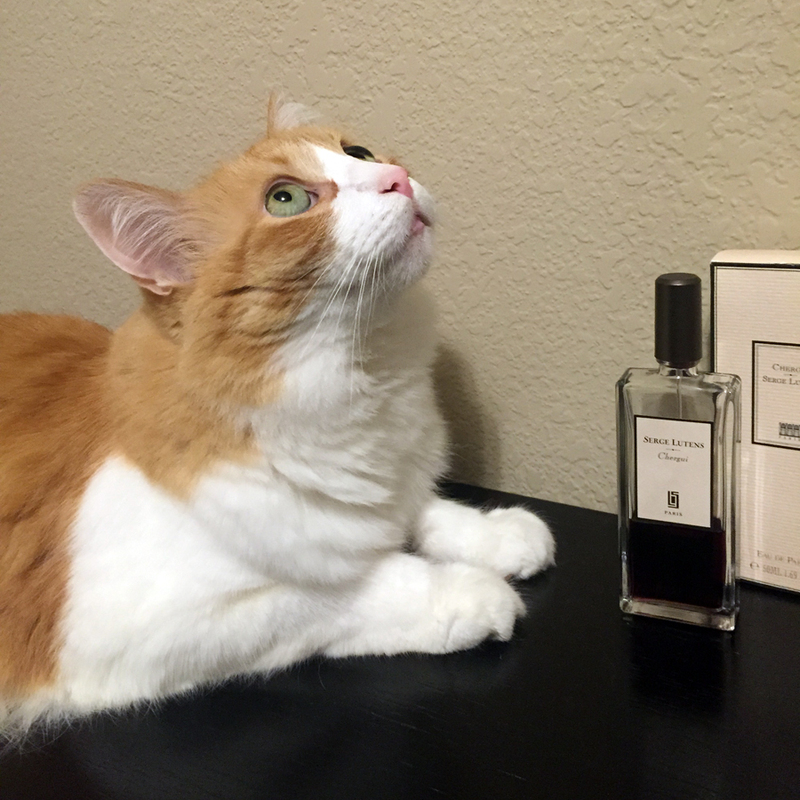 This entry was posted in "Four legs good", Favorite Perfumes and tagged Chergui, Serge Lutens. Bookmark the permalink. I love Chergui but have been wearing it almost exclusively in winter. Now will try it in summer! Try – you might be pleasantly surprised (as I was). I’m sure you remember I have many issues with SL fragrances. When I thought I found the one for me (Fourreau Noir) after some time I realised I never wear it and gave it away. Even though there are at least 5 perfumes that I like, own and wear and at least 5 more that I wouldn’t mind owning, in general I’m rather not a Lutens fan, so I understand you completely: unless you have an easy access to try them all in a slow pace, there’s a good chance that you’ve tried many of those that didn’t work for me either. The only Serge I own otherwise is Un Lys, which is nearly gone. I shan’t replace it, though I love it dearly. Before I discovered Songes, it might have been my favourite floral (or in the top few!). I noticed that item on your sale, and since I was working this post (I waited for the proper time in terms of lighting to take a picture of 2 boxes), I smiled and thought that probably something was in the air. Being very much out of the loop in terms of perfume news, I hadn’t heard about the repackaging of some of the Serge Lutens fragrances until you mentioned it here (so I just did a quick search on it). I won’t be buying any backups for myself but I will continue buying Chergui for my sisters, assuming it continues to be available here in the US. Hm, sounds like I will have to buy it now in larger bottles at a higher price … ? Thank you again: without you I might have never tried this perfume. I won’t be buying any SL bottles even if they are being changed up/discontinued…but this post brings to mind that I also discovered a great honey to wear in the summer which smells completely different from how it smelled in the winter…Absolue Pour Le Soir…the heat amps up the honey, resins and creaminess…in the winter it was pure naughty and skank-LOL! it is funny how a drastic change in temperature can make a perfume behave completely different on your skin….I also enjoy SSS Winter Woods in the summer…the amber/vanilla accord is amplified. Interesting… I think I still have Absolue Pour Le Soir sample so I might dare to try it once again this summer though on the previous approach it was just horrible. Winter Woods I like as is so I probably will keep it as a winter scent but it’s an interesting idea to try perfumes in the opposite weather. As I recently discovered, Byredo’s La Tulipe that I always considered to be a summer scent proved to be wonderful in cool weather. I just read Suzanne’s write-up of Chergui, thank you for linking it. I had the same experience with Chergui. I didn’t think much of it on my skin until wearing it in hotter conditions. It really did “bloom” and come into its own with some heat. Good to know I’m not alone in that experience! Always love seeing a photo of Rusty, whether he’s interested in the perfume at hand or not! It’s interesting that several people discovered this “heat” trick with this perfume. I should venture further into experimenting with my “winter” perfumes in warm/hot weather: since I like the former more, I have more of them and not enough time to wear. Ah Chergui, the most bought and sold-on fragrance in Perfumeland. I bought and sold it twice. Great to hear it works well in warm weather, like Coromandel. I’m wondering if I should buy a back-up of La Fille de Berlin in case it’s reformulated. The real brain-teaser is how V got a bottle of perfume out of the UK through the Royal Mail! That’s easy: she didn’t :) My friend, a.k.a. Perfume Mule, brought it from the business trip to the U.K. office. When I first tried Chergui, it was from a small atomkzer that I was able to charm from a Barneys SA. I used 2 sprays and hated it because it smelled like bug spray. Some time later (a few months), I went for broke which meant 4 – 5 sprays and i sang hallelujah. I then went for a split and then finally got a FB for cheap at Fragrancenet. I will answer your question about buying back- up SL once ai return from vacation! After you do the final tally of the bottles from you trip? ;) I do not need any Bu bottles (I think) but I’m still considering a couple of FBs for decants that I like wearing. I don’t remember changing my attitude towards any perfume dramatically but on more than one occasion it moved one way or the other on closer encounter. Whether you end up liking it or hating, this is one of those perfumes that are worth trying (before they were reformulating to death). Many years ago I debated between Cherui and Fumerie Turque, as I could only afford one bottle. This was very early on in my perfume slide to borderline hoarding issues. I chose Fumerie Turque, which I love, but it has to be dead cold. I can’t really remember Chergui anymore; will have to find my old sample which is around somewhere. Now I’m curious about the honey note. I agree about cold as a prerequisite to wearing Fumerie Turque: I tried it in warmer weather and I got so tired of it that I couldn’t go back to it for a long while. I actually sold quite a few of my SLs because I realised I didn’t wear them. I kept a few more for sentimental reasons and I think I have enough ambre sultan in the one bottle I have. De profundis, however, I should like to get before prices go up, as I feel those 10mls in my bottle is not enough, and I keep contemplating Bas de Soie, which I have a soft spot for. I have to echo Asali here. I used to own a number of Serge Lutens: Un lys, Sa Majeste la Rose, Sarrasins in a decant, and briefly Daim Blond. I sold all of them in the end. Only Sarrasins has stayed with me. But Chergui I do not remember-how awful for a tobacco maniac! Shouls have bought: Rose de Nuit, Santal Blanc, Vetiver Oriental-but that’s life. Since I’m usually very slow with my decisions on new perfume purchases, there were many SL perfumes that I didn’t mind and even wore from time to time from decants but they never turned into FBs. And now, since I still have not finished those decants, I can’t justify buying a bottle. Hopefully, I won’t regret it in a year or two. You should try! I didn’t realize how interesting it would be on my skin in the heat until I actually tried it.